Chloride levels in Minnesota surface water and groundwater resources are increasing, and maximizing efficiency of commercial water softening can reduce chloride discharge to the environment. A study was conducted to evaluate water softener settings and functionality at five Minnesota Department of Transportation rest area sites and to compare chloride levels in their septic systems. Sites included: Marion Rest Area (RA), Blue Earth Westbound (WB) RA, Oakland Woods RA, Fuller Lake RA and Central Minnesota Travel Information Center (TIC). Water treatment professionals inspected water softeners, and samples were collected to evaluate chloride levels in septic system lift stations. Additionally, water-quality tests were conducted to characterize drinking water iron, hardness and chloride levels. Water softener efficiency and chloride contributions from softeners and other major sources were estimated for each site based on water use and salt use records. Chloride levels in the septic system lift stations were found to range from 488-1,730 mg/L (Figure 1), with the highest chloride levels found at sites with the lowest estimated softener efficiency. The highest wastewater chloride levels were observed in Blue Earth WB RA, where the water softener meter was broken and the softener was set to regenerate every few days instead of on demand. 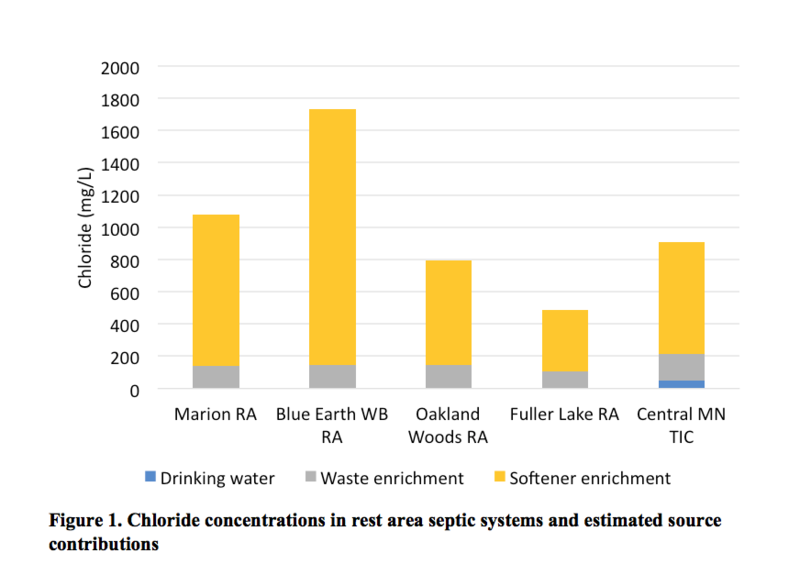 Water softeners were estimated to contribute between 77 and 92 percent of the chloride measured across the site septic systems, with the remaining chloride coming from human waste and drinking water chloride concentrations (Figure 1). Brine from water softener discharge has very high chloride levels, and previous research has found that elevated chloride levels may have an inhibitory effect on microorganisms in septic tanks. The chloride levels observed across the rest area sites were high, indicating they may be impacting septic system performance and treatment. Reducing chloride discharge from softeners by increasing salt use efficiency is beneficial to septic systems. Recommendations to maximize commercial softening efficiency include using demand-based, twin-tank softeners; periodically servicing softeners to check settings and functionality; keeping records of salt purchases and use; using iron filters in areas with high iron levels and routing discharge away from the septic system; and using results of laboratory water-quality tests to establish water softener settings. If a home or facility has a water softener, it is wise to ensure it uses as little salt as needed or to direct the softener discharge away from the septic system.